During his summer internship at the American Museum of Natural History, Haverford senior Johnson searched for signs of life from a bygone geologic era. What happened to life on Earth after that infamous asteroid hit the Yucatan more than 65 million years ago? That's a question Brian Johnson '08 pondered during his summer internship with paleontologist Neil Landman at the American Museum of Natural History in New York City. Johnson is a geology major, but his true passion lies in paleontologyâ€”which, contrary to popular opinion, doesn't always involve dinosaurs.“In fact,” he says,“most paleontologists focus on invertebrates.” One of Johnson's geology professors at Bryn Mawr, Bruce Saunders, knew Neil Landman as a colleague and co-author and recommended Johnson for the prestigious internship, knowing that Landman's research would mesh with Johnson's interests. Johnson, Landman and their colleagues pursued their project in Freehold, N.J., at a near-shore marine environment where diverse forms of life from immediately preceding and following the asteroid impact have been preserved. The researchers hoped to discover the kind of life forms that were able to survive and thrive at the Cretaceous/Tertiary Boundary, which Johnson explains:“Dinosaurs lived during the Cretaceous period, but the impact of the asteroid brought about a new geologic era called Tertiary.” Scientists can tell when one era ends and another begins because of something called the Iridium Anomaly. â€œIridium is an element extremely rare on Earth but abundant in asteroids,” says Johnson.“When an asteroid hits Earth, it blows dust into the air and spreads a thin layer of it all over the planet.” At the Cretaceous/Tertiary Boundary, evidence of the anomaly can be found in increases of parts per million of iridium. 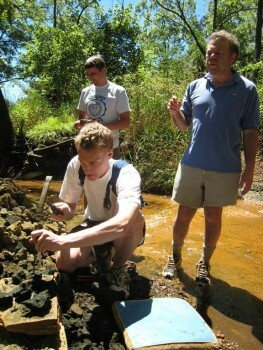 In New Jersey, Neil Landman was concentrating on the Cretaceous portion of the site and asked Johnson to study the Tertiary layer to determine what kinds of species survived in that era, as well as what made them thrive. They were fortunate in finding that these layers formed the floor of a creek, and were worn down so thin that Johnson easily pried them off in slabs using a large axe called a maddock. He then took those slabs back to the museum lab, broke them into segments the size of marbles or golf balls, and extracted pieces of any fossils he found. In seeking the answer to this question, he has noticed a surprising trend. Most of the animals from that era are suspension-feeders; they sit at the bottom of a body of water and wait for food to come to them. They are also planktotrophs, feeding mainly on plankton. What's unusual about this, says Johnson, is that according to most of the papers he's read on this subject, there was a stark decrease in planktotrophs during the Tertiary period.“It makes sense that when a huge asteroid hits and blows dust into the air, it blots out the sun, and plant life decreases or dies,” he says.“All animals that eat plankton then suffer.” However, it appears that nearly 70 percent of the animals Johnson discovered this summer feed off of plankton. â€œSo something different is going on here,” he says. Johnson may spend the rest of his senior year attempting to solve this mystery, but after graduating in May, he hopes to leave the lab behind and break into science writing and journalism.“I found that what I liked most was reading research papers and writing up my findings,” he says.